During the month of January, perhaps a hair beyond that, I am embarking on a dairy-free diet. Granted, I’m not one of those people that’s, “DIET! DIET! DIET!” I’m sure you’ve seen that on both my Instagram and this blog. I believe in eating healthy. I believe in eating balanced. I believe in eating two Tres Leches cake doughnuts followed by a hot chocolate from Doughnut Plant every so often. The old adage “moderation is key” is SO true, y’all. Removing dairy is not a huge issue; sure, I miss cheese like WHOA, I’ve had to consciously meal-prep breakfasts more as I can’t easily grab a Siggi’s and fruit on my way out the door, and I damn near keeled over when my department’s Director of Nursing bought our office pizza yesterday, BUT…I’ve got this. I’ve just got to be creative and mindful. I wanted to see if I could use the creamy power of pulverized cashews to make something insanely tasty. I’ve mixed in lots of things with cashew cream in the past, but as I had to sadly turn down ranch dressing for my salad at dinner the other night – damn near torture for me – I wanted to see if I could take those wonderful ranch flavors and make them into something not mixed into a cow’s utter secretions. The result was pretty damn good! I immediately texted my friend Liana – one of my best vegan friends to bounce my food ideas off of – as soon as I tasted it; I figured she’d be the only person immediately as excited as I was. Ha! I miss that quintessential buttermilk tang, but I was very shocked and pleased by what I created. In this case, the dill really saved the day when bringing that good ranch flavor to this dressing. – Oil of choice can be substituted for avocado oil here. Olive oil works just fine. 1.) Add cashews to a large bowl and cover with 3 cups hot water. Allow to stand for at least one hour or up to 8 hours. (NOTE: I always do an hour of soaking with fine results.) Drain cashews and place into food processor or high-speed blender. 2.) Pulse cashews until a fine meal forms. Slowly add in 1/4 cup water and blend until mixture begins to thin out slightly; do this twice more in 1/4 cup water increments. With the final 1/4 cup of water, add in avocado oil. Blend until smooth. 3.) Remove cashew cream and add to large bowl. Gently fold in chives, dill, parsley, garlic powder, and lemon juice until combined. Add salt; add more to taste, if desired. 4.) Refrigerate dressing; will keep in fridge for up to a week. – It’s chock full of cucumber. (It’s not just a cleaver recipe name…) Crisp, refreshing, and full of water. – The yogurt (I use Greek or skyr) gives you a good dose of probiotics. – It’s an excuse to stock up on fresh dill at the farmers’ market. I make this dinner for myself multiple times a week, usually supplemented by fruit, additional vegetables, or, 9 times out of 10, a giant hunk of Cabot cheddar cheese. I always say I’m going to cut back on my dairy. Now is not the time. Ha! – To keep recipe dairy-free, substitute non-dairy yogurt; I would not recommend coconut milk yogurt (I can still taste the coconut! ), but a soy-based non-dairy yogurt, such as Silk. On Silk’s web site, they say they can not claim their yogurt to be straight-up vegan, so I’ll leave y’all to be the judge of that if making this recipe. 1.) Peel, seed, and chop / slice cucumbers. Set aside. 2.) In a large bowl, mix yogurt, olive oil, garlic, garlic powder, dill, and salt until completely combined. Add cucumber and toss until cucumbers are completely coated. Place in refrigerator for 30 minutes to chill. Served chilled. Salad restaurant chains have become big business as of late. When I first moved to NYC in mid-2009, I was kind of…well…confused by the concept of delis and sandwich shops crafting made to order salads. Perhaps it was my own introversion that caused me to not want to take a container of greens to a guy behind a salad bar and tell him what vegetables I wanted in it. Couldn’t I go to a salad bar myself and craft my own? I was capable! In 2014, a Just Salad popped up a few blocks away from my Upper East Side office, and it was somewhat of a godsend. Still, my first trip there was dicey, because I sucked up my introversion, got a made – to – order salad…and was $15 dollars poorer by the end. From that point on, I stuck to salads that were on the menu and dealt with the loud cutting of vegetables and shouts of salad makers asking how much dressing I wanted. Though it’s certainly convenient on some work days, I’m definitely a fair weather friend. Works in a pinch, but I’ve never been blown away by the quality or price. About a week ago, a coveted Sweetgreen opened adjacent to the Columbia campus. Boasting organic and local salad fixings coupled with a popularity swell among many of my fellow social media food friends, I could not resist the call! I stood in line for a good 15 minutes among chattering Columbia students. How I survived that ordeal is beyond me. (Were any conversation I had at the age of 20 as vacant-sounding as the ones I had to endure overhearing? GOD, I hope not…) Still, compared to Just Salad, I’ll take their higher price point for what, in my opinion, is a much superior salad. It was crisp, fresh, and filling. I used a 1/3 of the kale, half of the apple, half of the pear, two ounces of the cheese, and an ounce of walnuts. I made the salad (sans dressing) comparable to my Sweetgreen’s salad for roughly $2.87. 1.) 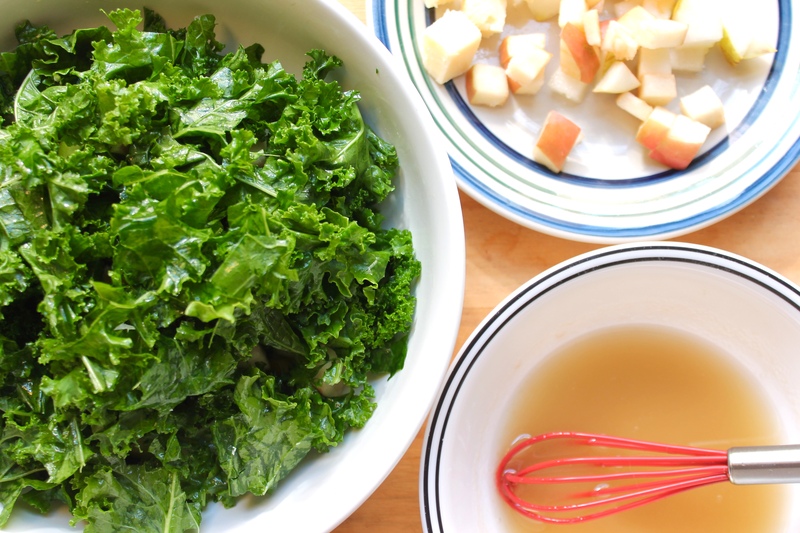 In a large bowl, add kale and olive oil. Massage olive oil into kale for approximately 30 – 60 seconds or until leaves are evenly coated in oil. 2.) 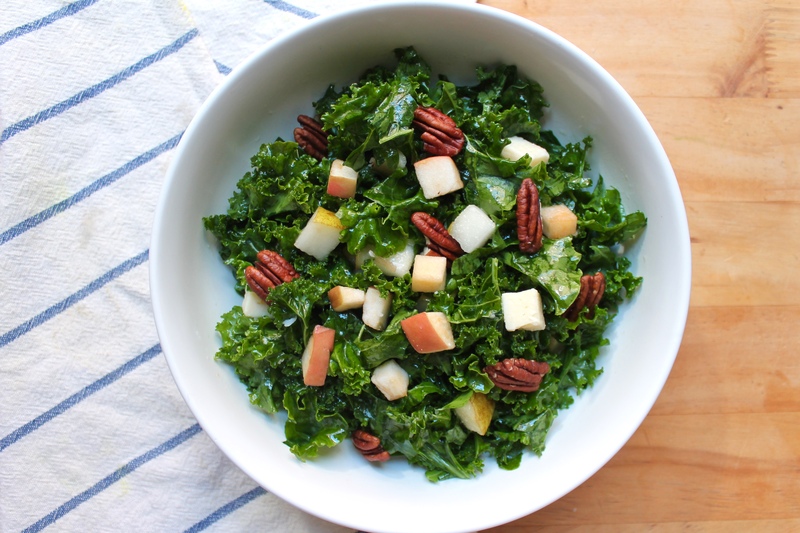 Toss fruits, cheese, and walnuts into kale. 3.) 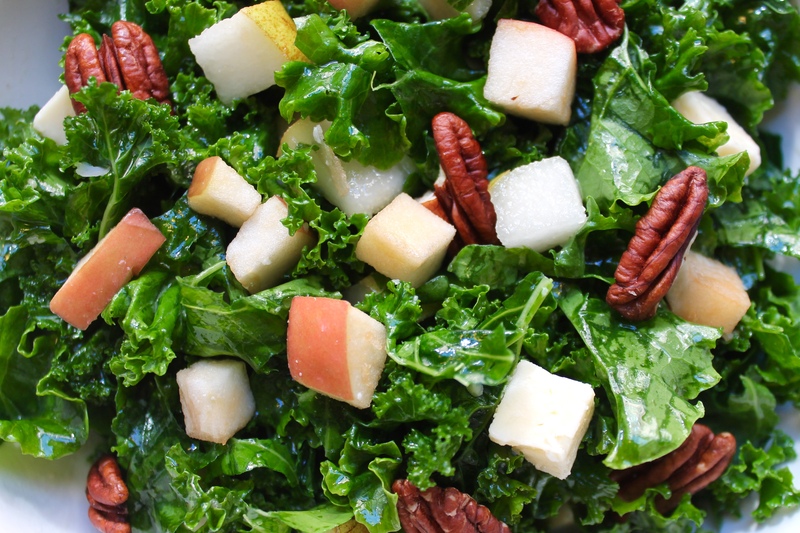 Toss with Apple Cider Vinaigrette or vinaigrette of choice. 4.) Serve immediately; if storing, place in airtight container. This salad will stay fresh in fridge for up to three days. Hey, guys! Welcome to Seek Satiation! My name is Allison, and I hope the recipes I post on this site do, indeed, satiate you! From kale chips to mac and cheese, from turmeric-infused donuts to hummus-slathered sweet potato toasts, there is something here to please every palate! 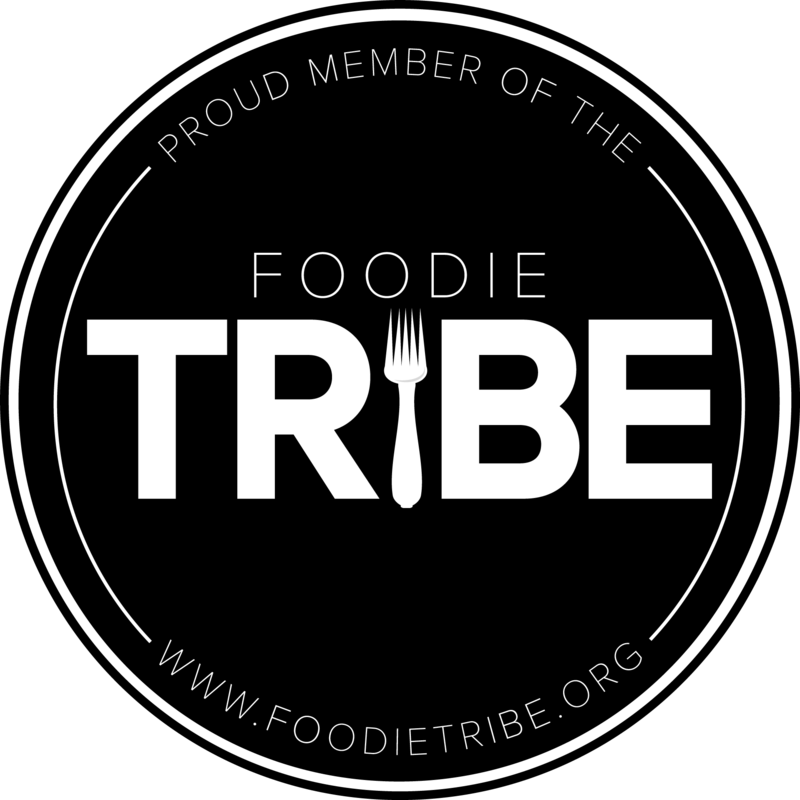 Proud Member of the Foodie Tribe! © 2015 Seek Satiation. All Rights Reserved.